Saving money vs inflation is a common worry among money savers. When inflation can wipe out a significant share of savings, solutions for protecting them are required. The exact definition of inflation is “the rate at which the average price level of a basket of selected goods and services in an economy increases over a period of time“. A country will select the most important goods and services their citizens buy. Then, their prices will be tracked, and an increase of the prices of the basket of goods and services, will signal inflation. Another name for this basket of goods and services is the consumer price index (CPI). An increase in the value of the index shows inflation, and a decrease from a previous higher index value is disinflation (decrease in the rate of inflation). Many savers ask themselves “Can saving money beat inflation”? The answer is both yes and no. Because inflation decreases the worth of money, saving money can only beat inflation if it is negative. And negative inflation is a completely different concept called deflation. Even if a person managed to save $100,000 per year (and didn’t invest any of it), with 1% inflation, the person would lose $1,000 of the savings. Only exceptions are the cases when a country experiences deflation or 0% inflation. From another perspective, even with a positive inflation percentage, saving money can help to beat inflation. Let’s look at how not saving money, saving money, and saving money together with investing, will affect the wealth of a person. Hypothetical yearly gains of savers vs non-savers. Copyright: Money Bear Club. Seen in the table, when saving money vs inflation is considered, saving money and also investing is the best choice. Not saving money at all will likely bring zero or even negative gains (because of inflation). Saving money without investing, will just grow wealth by the amount of the saved money. However, with positive inflation figures, these savings will lose some of their value. Saving money and investing is the best choice in this hypothetical scenario. The wealth of an investor will not only increase by the value of saved money, but also by the value of investing gains. If the investing gains are bigger than the inflation, the investor will achieve positive wealth growth. The answer to the question “Can saving money beat inflation?” depends on the perspective of a person. If some value depreciation is acceptable, then just saving money will be enough. However, if the person aims to growth their wealth, then saving money can beat inflation only in the case when the savings are invested. Read on to find out more about inflation vs savings, beating inflation through investing, and how inflation affects investors in different regions of the world. The US inflation rate has had an effect on the savings of USA citizens. USA inflation rate. 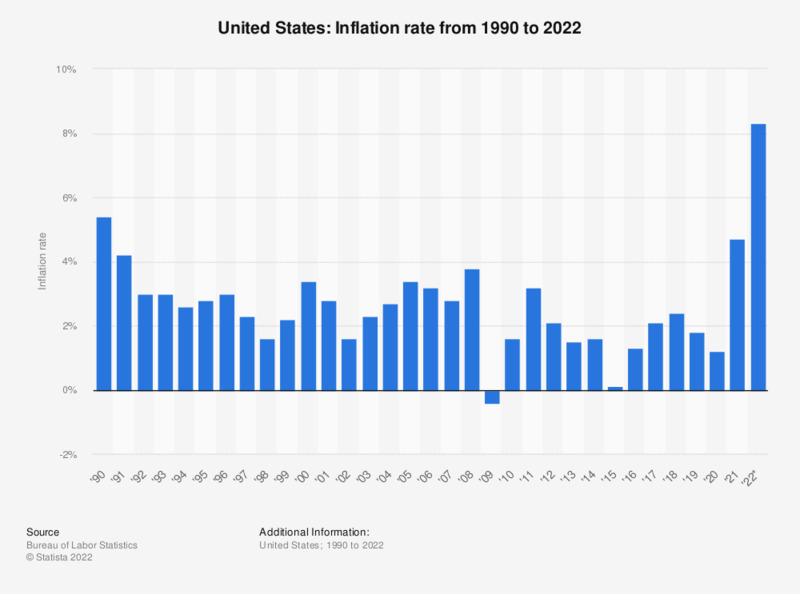 Source: https://www.statista.com/graphic/1/191077/inflation-rate-in-the-usa-since-1990.jpg. From 2009 to 2017, the USA inflation rate hasn’t risen above 3.5%, and was as low as -0.4%. This shows that the inflation numbers in USA have a wide range, and can change by as much as 1.5% percentage points (from 2013 to 2014). The volatile United States of America’s inflation numbers show two things. In the case of saving money vs inflation, US savers have to always keep up with the inflation numbers. They also have to be ready for unexpected changes. Investing in inflation protected bonds (inflation linked bonds) is a way for citizens of many countries, including USA’s and Canada’s, to protect their investments in periods when the inflation is high. Inflation protected bonds are a type of bonds issued by the Treasury (USA) or the Bank of Canada. The face value of inflation protected bonds increases, when inflation numbers increase. Investing in inflation linked bonds can be a smart move if an investor expects inflation numbers to rise in the future. Yet, timing the market (or in this case, the economy) rarely works. Hence, investing in inflation protected bonds should be done only when the investor is 100% confident in their investment choice. Inflation and saving money are two deeply tied concepts. Inflation can significantly affect the value of savings. How much consumers spend or save, affects the inflation numbers of countries. An interesting case of saving money vs inflation is seen by looking at Japan’s inflation rate. Japan’s inflation rate 1970-2015. 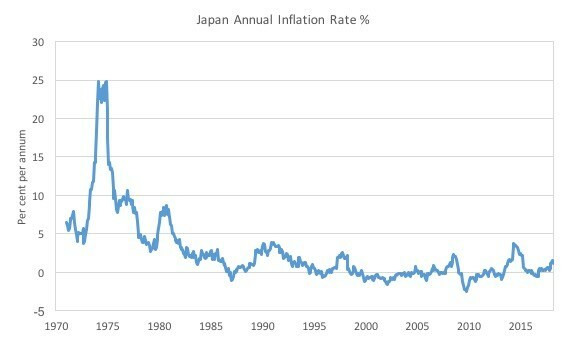 Source: https://heterodox.economicblogs.org/wp-content/uploads/2018/04/Japan_Annual_Inflation_Rate_1971_March_2018.jpg. For Japanese savers, the period between 2000 and 2010 produced a few years with a negative inflation (deflation). That means that the value of their saved money increased even without positive investing returns. Hence, saving money can beat inflation, but only if the inflation numbers are negative. A similar concept to deflation is lower inflation. Lower inflation rates pose different challenges and advantages to the investors. Lower inflation investing is a good environment for conservative investors. Since conservative investments tend to bring in lower returns, in times of low inflation, the returns of conservative investments become relatively higher than in times of high inflation. Let’s look at an example of how this process works. An investor chooses to invest into an index fund $100 yearly, and does it two years in a row. The growth in value of the index fund was 8% every year. The inflation percentage during the first year was 1.5%, and during the second year, 3% (this is a hypothetical example). After the first year, the invested $100 brought gains of $8, and because of the inflation, the real gains, while accounting for the monetary depreciation, were $6.5. After the second year, the second invested $100 brought gains of $8, and because of the inflation, the real gains were $5. The difference between these gains is just over 23%. An almost 25% difference is caused by the increase in inflation. Because of this, a low risk investment is a much more attractive investment option in times of low inflation. In times of low inflation rates, a low risk investment not only is a stable investment choice, but also one which delivers adequate returns. Lower inflation investing is also an important concept related to savings vs inflation. The lower the inflation in a given country, the more conservative investments will be appealing to the investors. Also, a low inflation level can stimulate consumer spending, thus positively affecting companies in consumer goods and services spheres. A low inflation level encourages consumer spending when it coincides with low interest rates (which happens often). When low inflation coincides with low interest rates, consumers are encouraged to borrow because borrowing becomes cheaper. This stimulates consumer spending through borrowing. Investing in consumer goods and services spheres, during low inflation periods, can be a good way to make money from a potential increase in inflation in the future. The China inflation rate shows a stable and a growing economy. Although inflation increased after the 2008 crash, it has been very stable since 2012. CPI inflation investing in China would bring in largest gains for the investors, if it was focused on investments which thrive in low and stable inflationary periods. Chinese inflation rate from 2006 to 2016. Source: http://static1.businessinsider.com/image/5874408af10a9a99348b6beb-852. In contrast, the UK inflation rate has not been stable in the past 10 years. UK inflation rate from 2000. 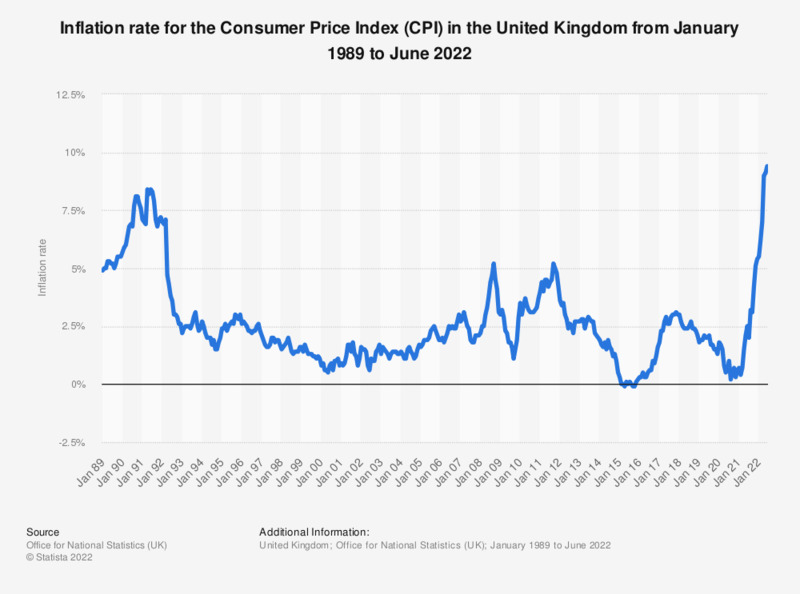 Source: https://www.statista.com/graphic/1/306648/inflation-rate-consumer-price-index-cpi-united-kingdom-uk-y-on-y.jpg. Compared to other major EU economies, its inflation rate is significantly higher, and by a large margin. 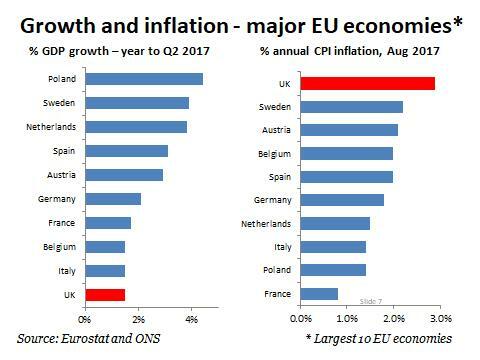 Inflation rates of UK and major EU economies. Source: https://pbs.twimg.com/media/DL8V-ImW0AAS41X.jpg. These statistics lead to the conclusion that for investors with high-risk tolerance, UK inflation linked investments (e.g UK inflation linked gilts) would be a rational choice. In other major EU economies, with their inflation numbers in the below-2% range, conservative investments would be the best choice. They would allow to capitalize on low inflation and stable returns. Inflation expectations play an important role in investing. Higher inflation expectations will lead to investors seeking investments with higher returns, and vice versa. Latin America inflation rates. Source: https://www.zerohedge.com/sites/default/files/images/user92183/imageroot/2015/11/GSLatinAmericaGrowthInflationMap.png. Thus, in regions like Latin America, where high inflation numbers are common, the investors should identify their own inflation expectations and evaluate them. Else, lower inflation expectations could lead to investments which are based on wrong assumptions. For investors in countries like Brazil, where the inflation in 2015 was 10%, inflation expectations can make or break their investments. If an investor were to expect even higher inflation numbers, then the smart move would be investing in higher-return, high risk investments. Or, investing into inflation-linked investments – inflation protected bonds. On the other side, low inflation expectations can be a double-edged sword. Low inflation expectations will motivate the investors to choose lower return (and mostly lower risk) investments. This would happen because a lower inflation percentage doesn’t pose a disadvantage to lower return investments, like a higher inflation percentage does. Nonetheless, lower inflation expectations could lead to investors overestimating the stability of an economy. This type of outlook can increase investments in sectors which underperform in times of high inflation (consumer goods, cars, electronics). For investors in regions with inflation numbers similar to Latin America, inflation proof investing can be the most rational investing strategy. Investing in industries or sectors that don’t lose value, or even gain value, in periods of high inflation, would be the right choice in inflation proof investing. Examples of industries that don’t tend to lose value during times of high inflation: utilities, energy and resource extraction. World inflation map. Source: https://en.actualitix.com/doc/maps/wld/world-map-inflation-rate-by-country.jpg. Investing in high inflation areas poses different challenges from investing in lower inflation areas. The world inflation map shows that the majority of African countries have an inflation percentage higher than 4%. This means that traditional investing methods may not work as well for African investors. A 3% savings account, or an annual 5% gain from stocks will not help investors in African countries. A 3% yearly return is not enough in regions, where inflation can be higher than 8.44%. Thus, investing in high inflation areas should be done with unconventional investing methods. One way of unconventionally investing in the African region can be taking advantage of the fast economic growth and development in the region. This fast growth will likely spur on the demand for new products or services. Investing in micro-enterprises or in up and coming businesses, thus, is the best choice to beat the inflation numbers in the African region. Other unconventional investing methods, suitable for protecting savings against inflation, can be peer-to-peer lending or investing in real estate. Investing for inflation protection is a type of investing strategy that seeks to maintain, rather than to grow savings or wealth. This type of investing strategy does not focus on maximizing growth. Rather than doing that, investors abiding by this strategy seek out stability and conservative investments. Suitable investments for inflation protection can be inflation linked bonds, inverse ETFs (when high inflation coincides with an economic downturn), and real estate. Real estate value tends to grow and bounce back after periods of high inflation. Also, in some markets, real estate growth beats the inflation numbers confidently. However, investors have to ask themselves why investing for inflation protection is their goal? If it is done in order to protect investments from very high inflation (e.g. Venezuela), then this goal has a strong justification behind it. 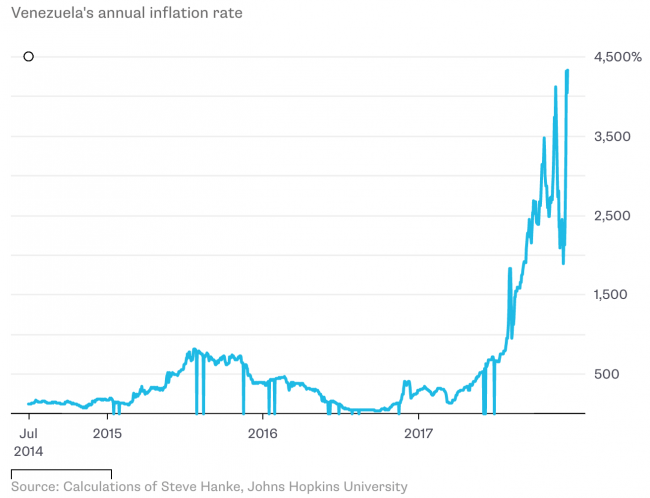 Inflation rate of Venezuela. Source: http://bruegel.org/wp-content/uploads/2018/02/Venezualas-annual-inflation-rate-e1519034210571.png. If it is done to protect investments from low inflation (in the context of other countries in the world), then following this goal isn’t necessary the best course of action. Low inflation numbers (0% to 2%) are small enough, as to not make a big impact on savings and investments. Thus, pursuing other investing goals, would be the more rational choice than investing for inflation protection. Beating inflation through investing is possible. Yet, the investors have to know the basics of inflation, its effects on investments and consumer spending, and how governments and central banks solve the problem of high inflation. Without the knowledge of the actions governments and central banks can undertake to control inflation (increased interest rates, decreased bond prices), investors can make the wrong decisions related to beating inflation through investing. Inflation beating through investing is a rather simple idea. The investments just have to grow in value more than the yearly percentage of inflation. If the yearly inflation is 2%, and the investments of an investor grow 2.1% (with investing fees), then the investor has succeeded in beating inflation. The main issue of beating inflation through investing occurs when an unpredicted rise in the inflation numbers happens. A previously successful investment then can turn into one which bring a loss to the investor. Hence, beating inflation depends on the investor’s ability to analyse, and to predict future consumer price index changes. Predicting inflation numbers and analysing them, is impossible without the knowledge of calculus and a strong base of knowledge related to inflation. Thus, reading up on mathematics, government policies, mathematical economics, and similar subjects, is the way to start analysing inflation and predicting it. The best places to start analysing inflation on your own are articles and websites about mathematical methods for economics, mathematical economics, and government policies related to inflation. Inflation investing tips are mainly directed at investing during periods of high inflation (higher than 3% or 4%, depending on a region). Investing during inflation, in this case, seeks to identify periods of high inflation, examine the occurrence patterns of high inflation, and prepare for them in advance. Some investing tips for inflation are: keeping a close eye on the inflation numbers, adjusting investments according to inflation numbers, and choosing an appropriate investing strategy. Keeping a close eye on the inflation numbers is a core inflation investing tip. Without the knowledge of inflation numbers, an investor won’t be able to identify inflation patterns or to make appropriate investing decisions. Tracking a certain financial or economic statistic can also help the investors to see how the markets respond to changes in these numbers. Identifying patterns in these responses can lead to the investors cashing in from the right predictions tied to the patterns. Inflation investing tips. Copyright: Money Bear Club. Adjusting investments according to inflation numbers and choosing an appropriate investing strategy are two important inflation tips. Without adjusting investments according to inflation numbers, investors risk either not taking advantage of higher inflation, or investing in high risk investments. If mid and low risk investments aren’t changed in periods of high inflation (e.g. to inflation linked bonds), investors risk missing out on the benefits of high inflation. Investing in high risk investments during times of low inflation, from a conservative angle, becomes an unjustified gamble. High risk investments, like derivatives or commodities, are a rational choice in times of growing inflation, as their high risk also can potentially bring very high returns. Yet, in times when the inflation is low, high risk investments are like lottery tickets. Why should an investor buy a lottery ticket when there are investments which will deliver adequate gains without the high risks? The investments which become the safest and the most valuable during periods of high inflation are: inflation linked bonds, and industries like utilities and resource extraction. Choosing an appropriate investing strategy is an obvious tip for inflation-focused investing. An aggressive strategy for periods of high inflation will not work well in periods of low inflation, and vice versa. Inflation and its advantages and disadvantages, are heavily based on numbers and calculations. The fundamentals don’t play a big role in inflationary matters like technicals do. The problem of saving money vs inflation then becomes a pure problem of numbers, and the evaluation of them. And even numbers aren’t exempt from being misunderstood by our own heuristics biases. In situations like these, even numbers can mislead. Decisions related to saving money during high inflation periods require numerical skills, ability to pick investments which thrive in high inflation periods, and knowledge of government policies. Minimizing savings losses due to inflation may be a complex process. Yet, the many approaches to it make it interesting and exciting. ‹ How profitable is real estate crowdfunding?